← No Fill Marks? … New video intro to previous post about my French press. Do you and some other people have a shared situation you face together? Your shared situation can be whatever you are dealing with or considering. This graphic shows a process you can use, by starting at the top left and following the arrows (see 7-step overview below). 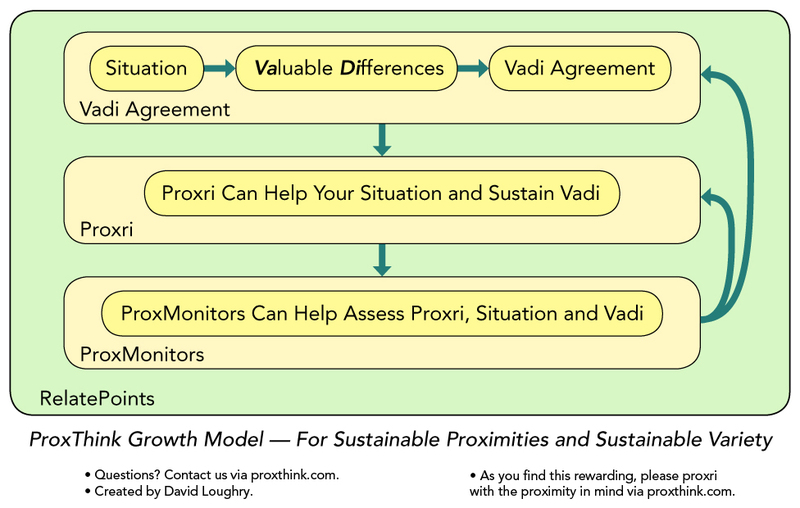 The graphic leverages the ProxThink Growth Model, which makes the proximity more of a tangible thing. As a result, people can better relate to the proximity of their shared situation, which can help them deal with it. This can also help create more sustainable proximities and sustainable variety. You can click the graphic for an enlarged view. Here’s a very brief 7-step overview of using the graphic. Adopt one or more RelatePoints for your shared collaboration. I like the Quip app. Consider and define your shared situation. Decide what valuable differences you are attempting to create, adapt and/or maintain. Create at least a simple Vadi Agreement. Consider needed or wanted proxri which can help your situation and sustain your valuable differences, and then proxri as appropriate. ProxPatterns may be helpful in considering needed or wanted proxri. Note that proxri can take many forms, including money, things, services, ideas, tasks, relationships, actions, and so on, as well as a combination of these. Create, adapt and/or maintain ProxMonitors. Use ProxMonitors to assess and reassess your proxri, situation, valuable differences and Vadi Agreement, looping back through steps as shown to make adjustments as needed. I’ll provide a longer 7-step description of the graphic later. Or, perhaps I’ll make a stretched version with more details and definitions. However, if you click through to the definitions, I think you should be able to use the brief overview above. I’m also working on some Quip templates with brief descriptions to use with the graphic, which I hope to present in workshops presented in-person and online. But I wanted to get this out there now in case I get run over by a bus or something! You can find more about the growth model here and proximity thinking here. A little about the development of this graphic: I had been working on some new examples to demonstrate the ProxThink Growth Model, as part of making a template for people to use with the Quip app. While doing that, I was also trying to better involve other parts of proximity thinking in an integrated way, which led to this graphic and some new insights, four of which are: 1.) It made me realize how considering a situation and creating a Vadi Agreement are related. 2.) It also made me realize that developing ideas for a situation can be proxri. 3.) And it made me look again at how the process of using the four growth model processes are related. One result is this new graphic. On the ProxThink site, I had presented the four processes in the order I thought they were easiest to learn. But this graphic shows it may be better to use them in a different order. 4.) I also realized that one person can use the growth model on their own! Questions? Contact us via proxthink.com. As you find this rewarding, please proxri with the proximity in mind via proxthink.com. This entry was posted in community, ProxMonitors, Proxri, ProxThink Growth Model, RelatePoints, Using ProxThink, Vadi Agreements and tagged Environment, flow, flowchart, graphic, process, Quip, shared challenges, Sustainability, teamwork, variety. Bookmark the permalink. This will be part of some upcoming workshops I’m developing, but is useful on its own too!